Probate - Probate is the court process whereby property is transferred after death to individuals named in a will or specified by law if there is no will. 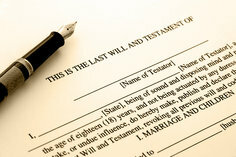 Probate can be expensive, public and time consuming. A revocable living trust is a great alternative that allows your estate to be managed more efficiently, at a lower cost and with more privacy than probating a will. A living trust can be more expensive to establish, but will avoid a complex probate proceeding. Even in states where probate is relatively simple, you may wish to set up a living trust to hold out of state property or for other reasons. Minor Children - If you have minor children, you not only need to nominate a guardian, but you also need to set up a trust to hold property for those children. If both parents pass away, and the child does not have a trust, the child’s inheritance could be held by the court until he or she turns 18, at which time the entire inheritance may be given to the child. By setting up a trust, which doesn’t have to come into existence until you pass away, you are ensuring that any money left to your child can be used for educational and living expenses and can be administered by someone you trust. You can also protect the inheritance you leave your beneficiaries from a future divorce as well as creditors. Second Marriages - Couples in which one or both of the spouses have children from a prior relationship should carefully consider whether a “simple” will is adequate. All too often, spouses execute simple wills in which they leave everything to each other, and then divide the property among their children. After the first spouse passes away, the second spouse inherits everything. That spouse may later get remarried and leave everything he or she received to the new spouse or to his or her own children, thereby depriving the former spouse’s children of any inheritance. Couples in such situations should establish a special marital trust to ensure children of both spouses will be provided for. Taxes - Although in 2011 and 2012, federal estate taxes only apply to estates over $5 million for individuals and $10 million for couples, that doesn’t mean that anyone with an estate under that amount should forget about tax planning. Many states still impose a state estate tax that should be planned around. Also, in 2013 the estate tax laws are slated to change, possibly with a much lower exemption amount. Incapacity Planning – Estate planning is not only about death planning. What happens if you become disabled? You need to have proper documents to enable someone you trust to manage your affairs if you become incapacitated. There are a myriad of options that you need to be aware of when authorizing someone to make decisions on your behalf, whether for your medical care or your financial affairs. If you don’t establish these important documents while you have capacity, your loved ones may have to go through an expensive and time-consuming guardianship or conservatorship proceeding to petition a judge to allow him or her to make decisions on your behalf. By failing to properly address potential obstacles, over the long term, a “simple” will can turn out to be incredibly costly. An experienced estate planning attorney can provide valuable insight and offer effective mechanisms to ensure your wishes are carried out in the most efficient manner possible while providing protection and comfort for you and your loved ones for years to come.